Is Obama Risking Summit Overload? A European vacation it is not. Over the next week, President Barack Obama will board his plane anew nearly every day so that he can attend individual meetings with at least 17 political leaders from 11 nations and appear at summits and forums in five countries to discuss international economic recovery, national security, cyberthreats and global warming. He will have tea with a Queen (England) and a private chat with a King (Saudi Arabia) and will convene a roundtable with students (Turkey). As an economic theory, the concept is widely accepted: When consumer and corporate spending collapses, government should increase its spending to prevent a downward economic spiral. The real controversy comes with the next questions: Which government, and by how much? Economists at the International Monetary Fund have recommended globally coordinated stimulus spending of about 2% of GDP to counteract the recession. But so far, that challenge has only been accepted to varying degrees. As a group, European countries, including members of the G-20 like France and Germany, have proposed lower rates of stimulus spending, both this year and next, raising concerns at the White House. In recent weeks, Obama and his advisers have made clear that much of the rest of the world will have to step up to the plate, especially in 2010, if the economic downturn continues. "We don't want a situation in which some countries are making extraordinary efforts and other countries aren't, with the hope that somehow the countries that are making those important steps lift everybody up," Obama said last week, in a prime-time press conference. But so far, European leaders have resisted the call for more stimulus. German Chancellor Angela Merkel has said she does not want to be bogged down by "artificial discussions" of fiscal stimulus, and like many of her peers would prefer to focus on fashioning a new regulatory structure to make sure the excesses and abuses that precipitated the crisis don't threaten the global financial system again. Other European leaders have also voiced skepticism over new discretionary-spending plans, arguing in part that the social safety net in Europe will automatically increase spending to handle much of the downturn. Rather than confront this conflict head-on, both the Obama Administration and European leaders have agreed to effectively dodge the issue for now by adopting language, in a draft communiqué, that pledges all nations to take "whatever action is necessary until growth is restored." At the same time, White House aides have been arguing in recent weeks that the glass is half full, and that the real test will come only if a second round of stimulus efforts is needed. "There's been an unprecedented coming together around stimulating the global economy," says Michael Froman, one of Obama's top international economic advisers. In other words, the battle over the size of economic stimulus will be mostly fought later, when economists have a better handle on the state of the economy and how much additional stimulus is needed. Obama's new plan for winning the war in Afghanistan and Pakistan is sweeping and resource-intensive, and it cannot be accomplished by the U.S. alone. 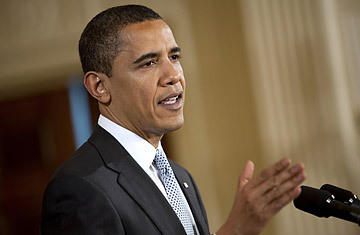 "As America does more, we will ask others to join us in doing their part," Obama announced last week. "From our partners and NATO allies, we will seek not simply troops but rather clearly defined capabilities: supporting the Afghan elections, training Afghan security forces, a greater civilian commitment to the Afghan people." The details of the commitments sought by Obama have not yet been announced publicly, though Obama's team has been working closely with many allies, both in Europe and beyond, to request specific aid. "We are making very specific asks," said Michelle Flournoy, an Under Secretary of Defense for Policy, who has been working on the Afghanistan plan. Obama plans to make a public pitch for international aid both at the NATO summit in Strasbourg on Friday and at the European Union summit in Prague on Saturday. Perhaps to head off any potential confrontations, the White House has not said that it expects any firm commitments in the coming week. On Saturday, Denis McDonough, one of Obama's national-security advisers, acknowledged the issue directly. "The challenge that we face is working closely with our friends and allies to underscore where we think we have shared challenges and where we address shared threats," he said. "And so that's obviously going to be an issue we discuss with our NATO allies." Two times is a coincidence, but three times makes a trend, so Obama will have to be careful about his gift-giving in Europe. On Saturday, White House spokesman Robert Gibbs declined a British reporter's request to disclose the gift the President will give to Queen Elizabeth II. "We don't want to give away all of our good news," said Gibbs, raising the stakes even higher. Indeed gifts are not the only petty detail that can soil an international relationship. The British press has also harped on the fact that Obama once referred to the "special partnership" between Britain and the U.S., instead of the traditional evocation of the "special relationship." Such granular details manage to exhaust some on Obama's staff. "I continue to be mystified about the difference between the two words," says Gibbs. At the moment, the world is roiled, leaders are nervous, and everyone wants a piece of the media magnet that is Barack Obama. That means the White House is expecting all kinds of posturing in and around the meetings with Obama for domestic consumption in various nations. Will Russian leader Dmitri Medvedev use the meeting to highlight the U.S. role in the financial collapse? Will Chinese President Hu Jintao bring up the proposal for a new international currency to supplant the U.S. dollar? Will Mirek Topolanek, the recently displaced Prime Minister of the Czech Republic, renew his rhetoric about the "road to hell" that Obama's economic policies present when they meet in Prague? Several European leaders who will host Obama are likely to use their meetings with the U.S. President to smooth the political waters at home. In Britain, amid rising unemployment, Brown faces daunting approval ratings and new elections in just over a year. In Germany, Angela Merkel's governing coalition is coming under increasing strain, with elections just six months away. And then there are the street protesters who will be vying for the spotlight. Large protests  against everything from capitalism to the structure of bank bailouts  are planned for both London and Strasbourg. Although Obama can't control all the people who will be riding his public profile, his team has planned a series of events at which the President can deliver his message directly to the world public. In Strasbourg on Friday, he will host a town hall, "taking some questions from students from throughout Europe and discussing the transatlantic alliance," according to an aide. In Turkey, Obama will host a "new media" roundtable discussion with young people from Europe and Southeast Asia. The hope of the Administration is that despite the various distractions, Obama will be able to maintain message control, something he showed a talent for during last year's presidential campaign.